Well, I haven't worn my Jester Socks yet. I kept them clean to show off at guild meeting and the library knit-in the next day. I don't want to wear beaded socks inside boots. We've had a couple of days of snow and so it's boot weather. 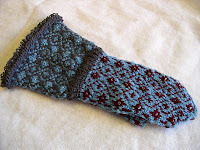 I promised my daughter in law a pair of Anna Zilboorg's Magnificent Mittens as a late birthday present. They are finally finished. Yes, I beaded them. The beads are #6 clear glass. The yarn was inherited from my mother. I lined these mittens with cashmere, from a mystery cone my LYS owner loaned me. I'm to return what I don't use. Here is the pair before sewing in the second lining. I really need to make myself a new pair. Mine have been sprouting holes this year. I've patched them for now. They'll have to wait. 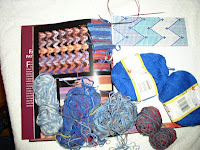 I have my SKA/Olympic challenge to knit starting Friday night and some secret socks for Plymouth Yarn to finish. They look like this on the inside. I have my Olympic project kit ready. I have my inspiration and my chart. 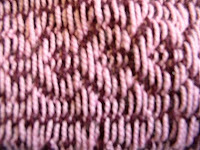 I'm using yarn left over from other pairs of socks. I've made a swatch for color and gauge. I need to tweak the chart a little. 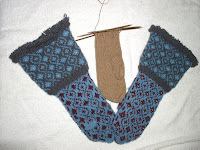 I'm doing intarsia and one edge of the leg has only one stitch of a color. I'll shift the chart a little to one side. I also need to decide exactly how I'm doing the cuff. It's rather important, since I start with the cuff. The deal is to start a project at the beginning of opening ceremonies and finish it before 12 PM the day of closing ceremonies. 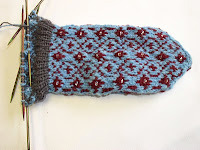 I also have another pair of secret socks to do by March 1, so I kept my commitment small. Motley Jester socks are finished!